What’s behind our great support team? A great help desk software! We started using Zendesk in 2009 as we needed to optimize our support process. Today we are proud to show everybody our performance! 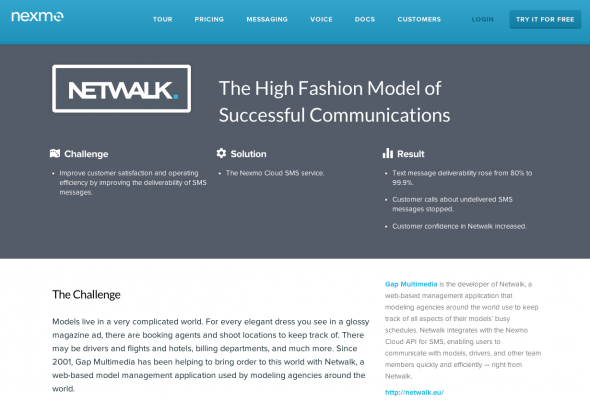 You probably know that Netwalk can send SMS (more or less everything inside Netwalk can be sent via SMS); what you probably don’t know is the technology behind it. Sending SMS is quite easy. The complicate part of it is choosing the right carrier! We have chosen Nexmo and today we are here to tell you why. Netwalk team is developing a new infrastructure that allows media to be delivered through Rackspace Cloud Files services. This innovation provides an easy to use online storage for files and media which can be delivered globally at blazing speeds over Akamai’s content delivery network (CDN).